Few people were hit harder with the death of Beau Biden, who passed away from brain cancer on Saturday at the age of 46, than his father, Vice President Joe Biden. After nearly losing Beau once as a young child, Joe raised his eldest son to become a fine politician, proving he really was his father's son, and an even finer man. The two remained extremely close throughout their lives, each giving the other shout-outs and loving words of support any chance they had. Joe and Beau's quotes about their father-son relationship give a poignant sense of how strong their bond was. The final few years of Beau's life were sadly embattled by health problems, having suffered a stroke in 2010 and then being diagnosed with brain cancer in 2013. After undergoing chemotherapy and radiation and being in remission for two years, Beau suffered a recurrence of his cancer earlier this month and died at the Walter Reed National Military Medical Center on Saturday. Tragically, this wasn't the first time the vice president has felt such immeasurable loss. In 1972, Joe lost his first wife, Neilia, and their infant daughter, Naomi, in a car accident right before Christmas. Beau and his younger brother, Hunter, were also injured in the incident, but luckily pulled through. Nearly losing Beau has undoubtedly fortified an unparalleled, unbreakable bond between father and son. As Meet the Press's Chuck Todd put it, "they were best friends." That same sentiment can be felt in Joe and Beau's own words to and about each other. Here are seven of the most touching father and son quotes about their bond. 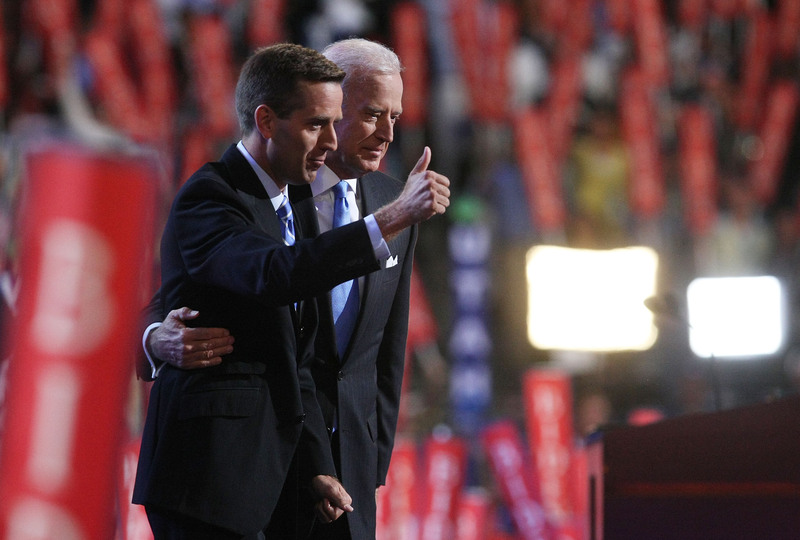 Beau Biden was, quite simply, the finest man any of us have ever known. Beau had the opportunity to introduce his father at the 2008 Democratic National Convention, where he opened with such a simple yet stirring line: "Good evening. I'm Beau Biden. And Joe Biden is my dad." He went on to describe how Joe always made his kids a priority, even at the beginning of a very busy Senate career. Many of you know him as a distinguished and accomplished senator. I know him as an incredible father and a loving grandfather. A man who hustled home to Delaware after the last vote so he wouldn't miss me and my brother's games. Who, after returning from some war-torn region of the world, would tiptoe into our room and kiss us goodnight. Who turns down some fancy cocktail party in Washington so he won't miss my daughter Natalie's birthday party. Just earlier this month, Joe spoke at Yale University's Class Day, where he described to the crowd his long commute between Washington D.C. and his home in Wilmington, Virginia. He's proud to say that his early days as a senator were equally defined by watching his kids grow as they were by Senate events. I began to commute thinking I was only going to stay a little while — four hours a day, every day — from Washington to Wilmington, which I’ve done for over 37 years. I did it because I wanted to be able to kiss them goodnight and kiss them in the morning the next day. ... But looking back on it, the truth be told, the real reason I went home every night was that I needed my children more than they needed me. After his son's warm introduction at the 2008 DNC, Joe returned the favor by letting Beau know just how proud he was of his eldest son. You know, folks, my dad used to have an expression. He'd say, "A father knows he's a success when he turns and looks at his son or daughter and know that they turned out better than he did." I'm a success; I'm a hell of a success. Beau, I love you. I'm so proud of you. I'm so proud of the son you've become; I'm so proud of the father you are. Also at the 2008 DNC, Beau asked the crowd and America for a huge favor. Because his dad was always there for him growing up, he wanted to make sure there'd always be someone watching out for dad. I know my father will be a great vice president. As I mentioned, my dad has always been there for me, my brother and my sister, every day. But because of other duties, it won't be possible for me to be here this fall to stand by him the way he stood by me. So I have something to ask of you. Be there for my dad like he was for me. But by focusing on my sons, I found my redemption. ... The incredible bond I have with my children is the gift I’m not sure I would have had, had I not been through what I went through. In 2010, when speaking at the Veterans of Foreign Wars 111th National Convention, Joe recounted a very personal story with an important veteran in his life, his son Beau. These homecomings are something I have long looked forward to, and I know many of you have as well. The day my son Beau returned from a yearlong tour in Iraq, and I watched him embrace his wife and children, was one of the proudest and happiest moments of my life.